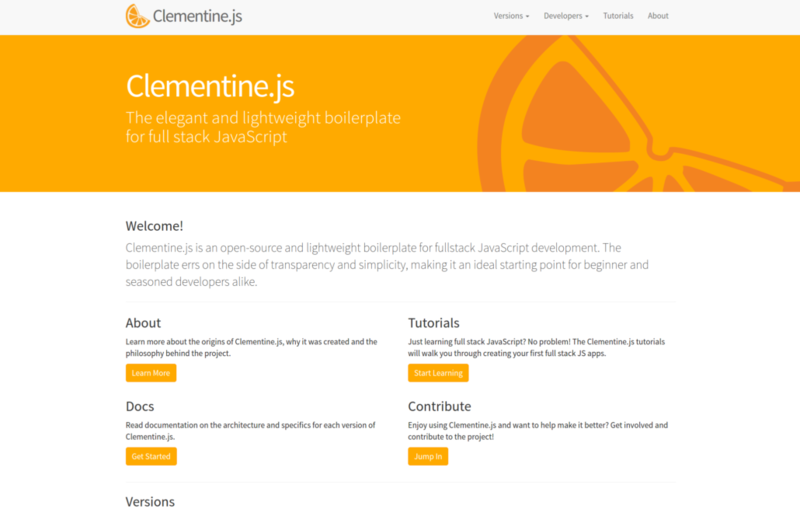 Enter Clementine.js: a relatively recent addition, developed by Blake Johnston in 2015. This boilerplate takes simplicity to the extreme, and is easily one of the lightest of its kind. For example, while it has three versions to choose from, the default is built with Node.js, MongoDB, and Express. There are no preferred front-end frameworks to commit to, and no extraneous technologies to bulk up the project and get in your way, although you can select an Angular version if you favor the MEAN stack. Each version lays out clear installation instructions and strong documentaion. There are tutorials for incorporating Angular, authentication, deploying successfully to Heroku, and for the absolute beginner to walk themselves through putting together what Clementine.js installs for them. Watch that space in the future, as tutorials on testing in Mocha and incorporating React.js for MERN stack projects are soon to come. Will this be the framework you use for every project you ever make? Absolutely not; there are good reasons why many of these other boilerplates and projects become so bloated, and not every tool works well for every project. But if you’re a beginner and you’re not utilizing Clementine.js, you are making more work for yourself. Like what Blake has done with Clementine.js? Consider contributing to the project. As with other open-source projects, it can only survive with the help of meaningful contributions. What are you building today? Continue the conversation in the comments!